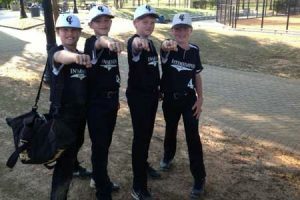 The Carolina Intimidators, with four Edgefield youth on the team, won the baseball tournament at Citizens Park in Aiken last weekend. They are pictured displaying the rings given for their first place finish. Pictured, Left to right: Hunter “Pretty Boy” Corley, Brycen “Cowboy” Patterson, Garrett “Bull” Hammond and Rhett “Porkchop” Jolly. Dean “Coach” Patterson is the coach.